Frequently I am sent low resolution or poor quality photos for the insert and even for the cover. I usually recommend reshooting them, but of course it’s too late by the time people get to the design phase. So we “make do” and I have to try to work my Photoshop magic on substandard photos. If your music looks unprofessional, people will interpret your music accordingly. Think ahead by hiring a photographer early on, and schedule several sessions with them. 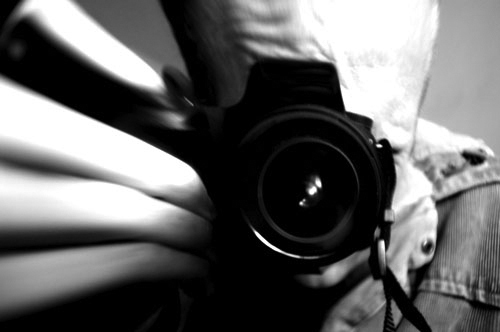 Don’t forget to get photos during your recording or filming sessions. A recording studio are a particularly difficult place to get good shots because of the lighting and tight space. Flash is not very flattering, especially in a tight space, so without a good fast lens, photos are often dark, blurry and full of noise (grain). Quality photos can be used for more than your CD/DVD insert – you need good photos for your website, posters, promotions, newspapers articles, and of course for posterity when you need to publish your memoirs. As a graphic designer who is also a photographer and a musician, I have a unique perspective on how I take photos. I take extra shots of backgrounds, details of instruments and with an eye toward what will work on a cover or interior spread. Other important features even many professional photographers don’t take into consideration are the proportions of how the image will be used – a CD cover is SQUARE (as are thumbnails on websites), DVD covers are tall while film is wide – and the key parts of the image (heads, feet, hands, instruments) should be well within the margins because the printed piece often cuts off a small amount of the outside of the photo (bleed). Leaving room for writing for a cover is also helpful. Be sure to get a full release for all photos for indefinite and unrestricted use. You cannot pull sharp, high resolution photos from video, even HD. Video is usually shot at a frame rate which results in about 1/250 of a second shutter speed, so any motion will be slightly blurred – by design – motion blur is actually what makes video look smooth and pleasing to watch, but does not make for a quality sharp still photo. That is why film productions always have a still photographer on set. Proof potential cover images at about 1 inch to see how it looks when it gets used as a thumbnail on a website or catalog. 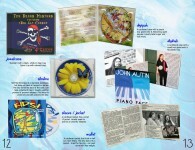 Designing CD/DVD inserts and packaging is unlike any other design, especially web design. 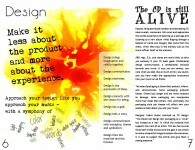 Many designers are very talented with a wonderful creative eye. But when asked to layout and design a CD/DVD, they are not qualified. When I began designing CDs and DVDs I had been doing general graphic design for nearly 10 years, but when I designed my first CD, I felt like I was learning it all over again. 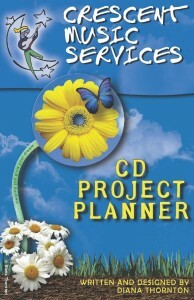 CDs and DVDs have particularly tight specs, and every printer uses different templates. They also include required elements such as copyright, publishing and contact information that are often overlooked, even by seasoned musicians. When someone calls me to get a quote on a project and they tell me they are doing their own graphic design, I grill them regarding who their designer is and what program they are using. 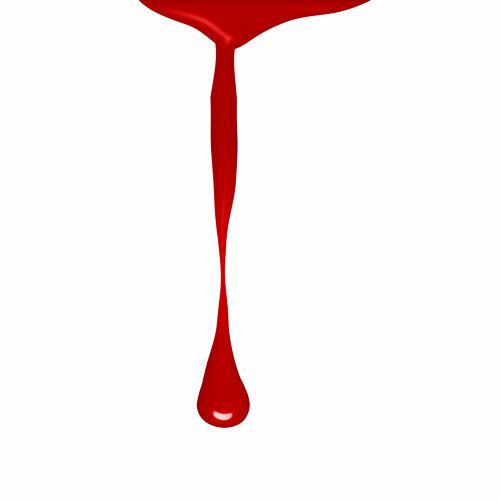 This is because, more often than not, I receive files that are not printable – they are not in my templates, don’t have bleed, in the wrong format, and even low resolution. Then I have to explain what is wrong with their files, and we all wait for them to be fixed. I even had to start offering “finishing services” because I was getting so many unprintable files from clients and designers. 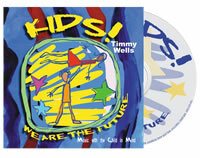 As an experienced CD/DVD designer, I recommend people use me or a designer familiar with CD/DVD design. I know budgets are tight, but your music is worth an extra 44 cents each to look professional and stay on schedule. Start your design well before your master is finished. By having your files ready to go to print the moment you finalize your times and tracks, you can keep things moving along. Digipaks can add as much as a week to your production schedule. Another delay is often caused by researching and getting your licenses at the last minute. The factory will not reproduce your CD/DVD without proof of licensing. Many projects can be held up because the licenses are not on Harry Fox or are held by an overseas publisher. This is particularly tricky when the publishing is held by multiple parties, and you have to track down and contact someone for 25% of a song. And sync licenses for film are a whole other level of complexity. Once you know what tracks you’re including on your album, start doing your research. Find out who the publishers are and how you can obtain licenses for each (Harry Fox, etc.). Bonus Tip: You don’t have to go through Harry Fox to get a mechanical license. If you know the writer/publisher, especially if they are local, you can get a written license directly from them. 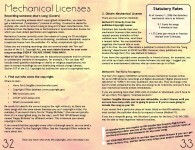 Here is an example of a license you can use. ISRC codes are not required for CDs, but they have become standard. I recommend purchasing your own code which is good for all future releases as well. You then assign each track a number and your mastering engineer will encode your master with them before creating your PMCD or DDP. Have these ready for your engineer before the mastering session. Before you send your CD/DVD to the factory, you will need to have it mastered/authored and then review a COPY made from that master to be sure all is exactly right. When I started Crescent Music Services back in 1997, I was fortunate to have as my business partner mastering engineer Parker Dinkins. I learned a great deal from him. One lesson was that the production master (PMCD) should not be touched by anyone but the engineer and the factory (he sealed it in a ziplock). Instead, he made a REFERENCE COPY directly from that master for review. If the reference copy is OK, then you know the master it was copied from is OK. Many things can happen during the burning process, so without this final and careful review, you can inadvertently send the factory a master with errors, missing tracks, pops, clicks and cut off songs. They do minimal error checking, so it’s up to you and your engineer to provide them with an error free master. Just because the mix sounded great on the last CD you were given doesn’t mean your production master burned correctly. I can’t stress this enough. Do not wait until the day you are sending the master to the factory to get it from your engineer. Always get TWO productions masters (PMCD) from your engineer – one to send to the factory and one for you to keep somewhere safe. That way if your master gets damaged or lost on the way to the factory you have another to send quickly. Remember to get a review copy from EACH master. Even if your engineer uploads your music to the factory as a DDP (image file), request a PMCD and review copy for your own records. Don’t send your PMCD to the factory via the post office. Use a trackable carrier/method such as Fedex. I’ve seen too many masters get lost on the way with the post office (even their trackable service). Package it in a jewelbox and in a solid outer box (don’t use bubble mailers). Have more than one person review the reference copy. I hope these tips help your next project go smoothly and on schedule. Give me a call to discuss your design, photography, and manufacturing. 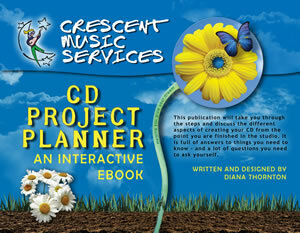 Please download my free ebook “CD Project Planner” for even more information. When I design or layout a CD or DVD for a client, they are responsible for providing me with the text and photos they want to include. After over 400 projects, I have noticed a few commonly forgotten elements. I don’t have time read everything, as I am usually concentrating on the design, but I do try to watch for a few critical things. This is probably the most obvious, important and the most overlooked of all, and the one everyone kicks themselves over forgetting. Try to only use websites or phone numbers that probably won’t change. TIP: One great way to get people to actually USE your contact info is to post your lyrics and other exclusive content (more pictures, free downloads, etc.) on your website with a place for them to sign up for your mailing list. DJs need these times to schedule their playlist. Anyone who has contributed to your album deserves to be listed. And by the way, DO be sure to spell their names right. It’s nice to also provide contact info for them if they want it (especially photographers, studios, etc.). Honor the people who have made the CD and the music possible. Good Karma. This is as important whether you wrote the songs or you are covering someone else’s. Not required, but few CDs feature a single player. Fans love to see the faces and instruments of the music they’re hearing. They love to see you in a less formal setting and in the process of making music. Furthermore, it shows appreciation for your players, even if they’re a session player and not a regular part of your band. (Don’t forget to identify the people in the pictures). Notes about each song, especially if they are originals. People love to learn about the creative process you went through, and what the song means to you. 3. Misspelled words and poor grammar. Don’t rely on spell check. Proof carefully. Proof again. Show it to someone else. And then read it backwards. We are all only human and mistakes WILL happen, and when they do, don’t stress. It happens to even the big label names – Beatles’ albums are notorious for all sorts of errors. A Google search for “liner notes errors” returns hundreds of posts about big name mistakes. Fix it in the reorder and the first run will become a collector’s edition. Now you can request 100% recycled paper for your wallets, jackets and digipaks for no additional charge. 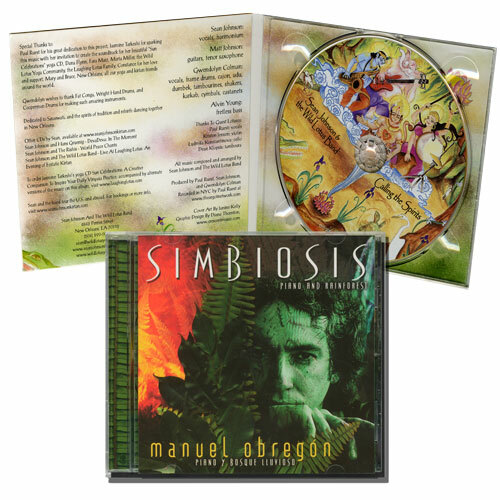 Add 100% plastic trays in your digipaks for 15 cents each for the total recycled experience. 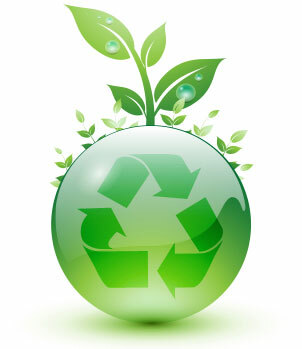 Furthermore, our printer is FSC & Rainforest Alliance Certified and use Linseed Oil based inks and water-based gloss coating. AND, our DVD cases are also 100% recycled. Does the paper look recycled? I don’t want my packaging to look rough or dull. The recycled paperboard is just as bright and white and smooth as the non-recycled stock. The plastic trays do have a very slight tinge to them, but it’s subtle, and they say “100% recycled” on them. Can I reorder my cds on the recycled? Yes, just let me know and I’ll add it to the purchase order. Can I order recycled for my jewelcase inserts or cases? No, not yet. I’ll let you know when that is available. Only DVD cases are recycled. Call Diana today at 504-312-2354 to order your next wallet, sleeve or digipak on 100% recycled! Please allow enough time – 3-14 days is typical. Compile all material that you want to include in your design: photos, text, original artwork to be scanned, logos, etc. Text for lyrics, credits, song titles, liner notes, etc. in an electronic format. Submit all text in a single file if possible. Please don’t send pieces, changes, etc. 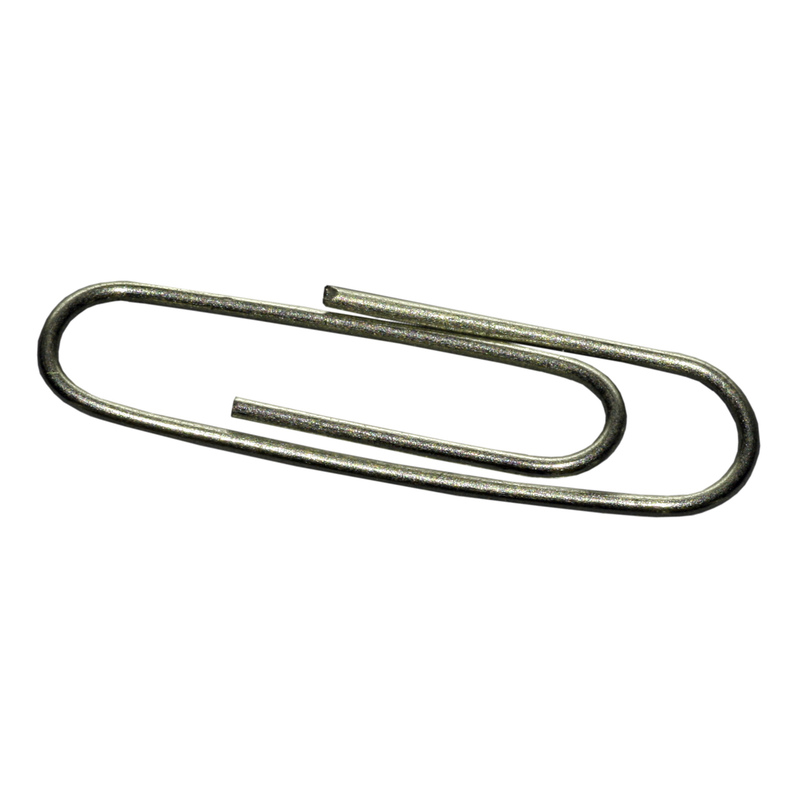 in many different emails – this can lead to our my missing something. It also makes it difficult for me to see an overview. Don’t worry about formatting (making it look pretty) your text – that’s my job. DO insert comments such as “back page” or “put band photo near this” to guide me. Don’t use spaces in place of tabs. 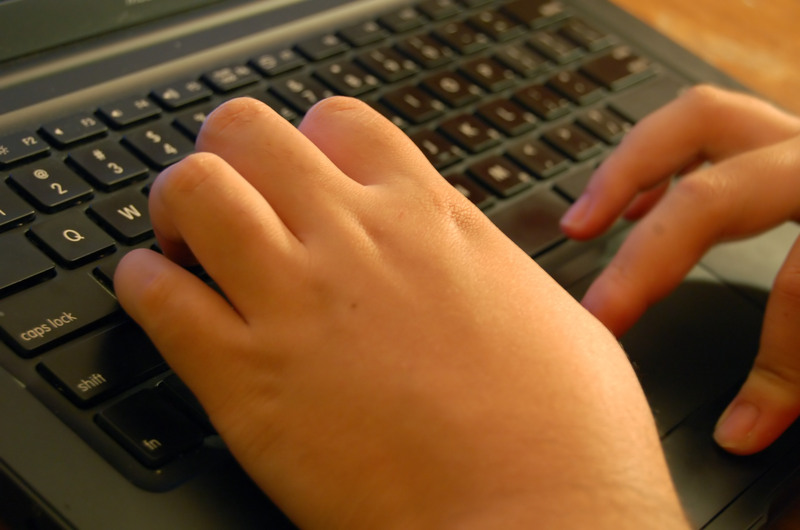 Just use the Enter key twice to start a new paragraph. Don’t use double spaces between sentences. Don’t lay things in columns, especially by tabbing. Run your text straight down the page. If you want things in columns, let me know and I’ll format that on my end. If you tab over for a new column, I literally have to cut and paste the text out of that because it doesn’t flow the same in my program. Very time consuming and leads to things ending up in the wrong place. I prefer Microsoft Word, RTF, or TXT, or you can email your text. Non-digital (hand-written or paper printouts) text may incur additional input charges. COPYRIGHT: When providing artwork or files to Crescent Music Services, you represent you have the right to use and reproduce this image. You may not reproduce copyrighted materials from artists, photographers, or other authors of original works without express written permission from the author. Crescent Music Services is not liable or responsible for any inappropriate uses. High contrast, colorful images work best for covers. Consider the impact and message of the image. Does it communicate the message of your music or other content of your disc? If you provide your photos digitally, TIF is the best. If you provide an EPS, do NOT check the box “include half-tone screen” in the save dialog. Images should be either CMYK or greyscale at 300dpi or more at 100% of the size it will be used. If you must provide JPG, save as largest file size possible to avoid degradation, and avoid opening and resaving the file too many times because that decreases quality each time. SCANNING: Clean your scanner glass with a soft cloth before placing each item. 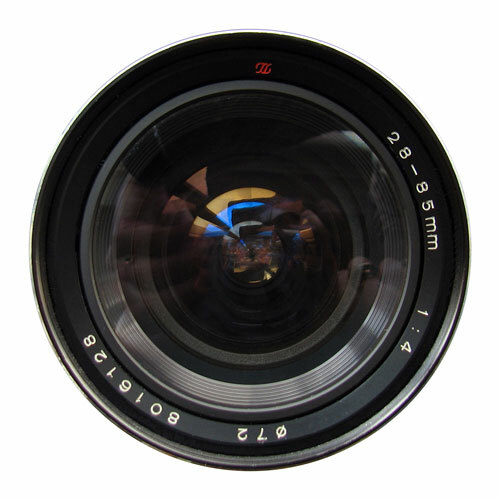 Digital cameras should be set to the highest uncompressed format your camera has. Avoid cameras under 2.5 megapixles. Don’t send images in a Word file. I can not easily extract the images. Pulling images from a website: DON’T. 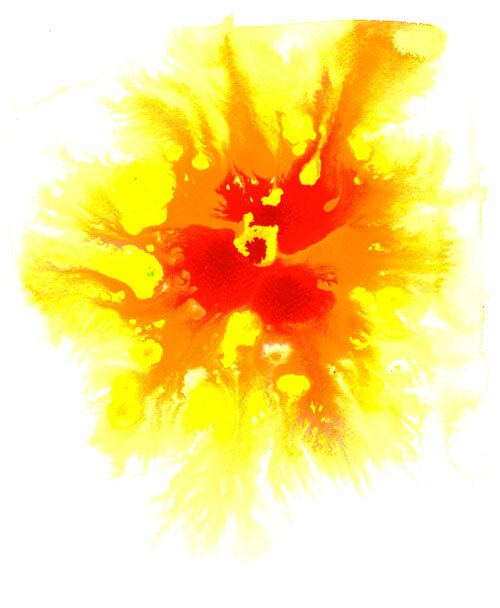 Don’t supply inkjet-printed art unless that’s all you have. I prefer prints of photos rather than slides or negatives. Slides or negatives will incur additional charges. Or you can take your slide to a local photo house (or even the local drug store) for digital conversion. You can provide a photo in color even if it will be reproduced in greyscale (black and white). I can convert it. I can accept artwork up to 11×17. Oversized art will incur additional charges for scanning. The bigger (up to 11×17) and cleaner the artwork (such as a logo), the better it will scan. I can search for photos and artwork if you don’t have anything. I have access to royalty free photos and artwork that might suit your purpose. I will spend a limited amount of time in this search for no additional charge. I can also point you to these sites to search yourself at no charge. I can create custom digital art in photoshop (up to 1/2 hour for no additional charge). Check out my digital artwork in the portfolio. Sketch and/or mock up of the layout to the best of your ability. This will give me a clearer idea as to how you would like your insert, traycard, and disc to look. These can be simple drawings on folded paper (or even a napkin). Commercial Examples: If there are any other CDs or DVDs you like the look of, show me. You can just give me the name and I’ll look it up on Amazon. Or you can send/give me the real thing to examine (I’ll give it back!). I can emulate any style. Or if there is a certain color or font you want, show me to match as closely as I can. I will be doing your layouts in Adobe InDesign (for paper elements) and Adobe Illustrator (for disc art). I use Photoshop for photographic elements and special effects. I work on the PC, but can read most Mac files. FONTS: TTF or OTF (I have about 12,000). You can provide your files partially created in these applications, if you wish for me to finish and do the prepress. If you plan to go this route, please refer to myÂ designer guide in order to avoid file issues once I take over. I cannot accept file formats such created in programs like Quark, E-Z CD and Neato labeller. I can, however, accept a PDF or EPS exported from many of these programs. Please speak with me before doing anything with these programs. 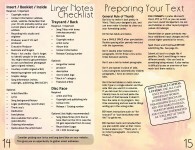 Proofs: I will provide you with PDFs of your layouts for proofing online. Modifications can be made until final approval with no extra charge (up to 3Â drafts). First Meeting: Discuss concept, schedule, review your materials, look at colors and fonts. I REQUEST THAT YOU PROVIDE ME WITH ALL OR AT LEAST MOST OF THE MATERIALS AT THE BEGINNING OF THE PROCESS. If you are still gathering a lot of stuff, it is usually better to wait until you have most of it. You are welcome to schedule a preliminary design consultation before your official “first meeting” to review your project and determine what pieces you need to gather. Drafts/Proofing: I layout, search photos, format your text, etc. The first draft can take up to 1-10 days depending on complexity and whether I have everything.. This first draft might be very very rough if I am still working out the design or waiting on some elements, or it might be 95% there. Every project will proceed differently. Your PDF Draft will be uploaded or emailed. I will provide up to 4 drafts with no additional charge. 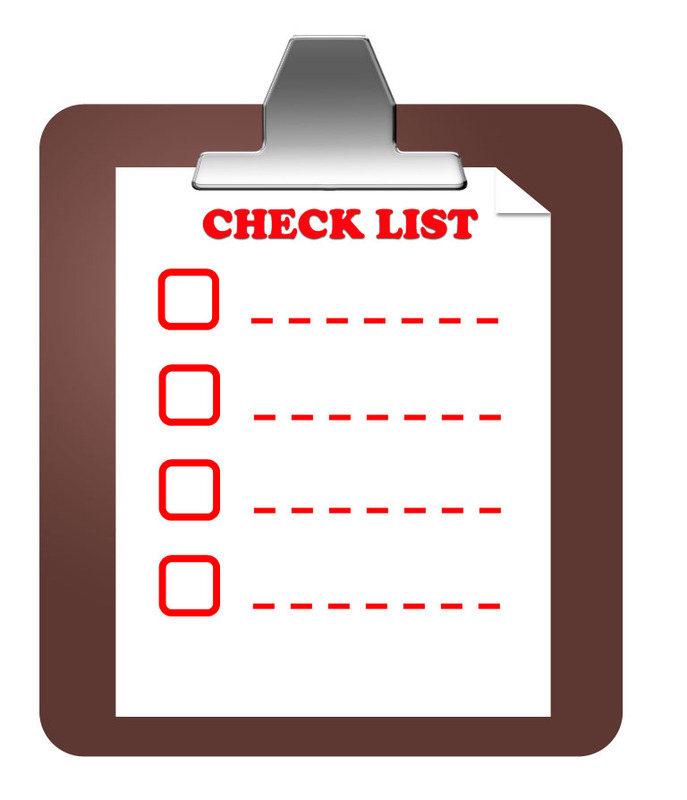 Please read “Proofing Checklist” to help you avoid embarrassing and costly oversights. Also, please don’t assume I am perfect either – proof everything I do with a critical eye. You won’t hurt my feelings. Approval: Final artwork must be approved IN WRITING by providing a written OK in an email. Once you approve the final artwork I will submit the files to the printer for production. IF YOU GET BACK TO ME BEFORE NOON, YOUR PROJECT CAN GO TO PRESS THAT DAY. ANY APPROVALS AFTER 2 WILL START THE NEXT BUSINESS DAY. Once the press is rolling you WILL incur additional charges if you need changes. How much more depends on where production must be stopped and how much work was done by the printer up to that point. At this point I can tell you when to expect your discs. 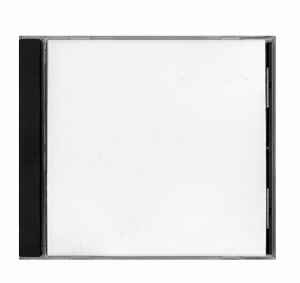 Jewelcase / Jewelbox – The industry standard plastic CD case. Recommended for retail projects. Also called a Jewelbox. Tray – the plastic part of the jewelcase that the disc snaps onto. Usually black, white or clear. The left side of the tray shows through when the case is closed. Clear trays allow printing on the inside of the traycard to show through (see below). Custom colors can be requested. Insert / Booklet / Folder – The front paper part that has the cover. The “back cover” is what you see on the left when you first open the jewelcase but don’t take out the paper. It slips in the front of the jewelcase to show through. 2-panel – a single sheet of paper with no folds – panels include the front cover and the back of the cover where you can put credits or other info. 4-panel – a single sheet folded in half like a greeting card. 6-panel – a single sheet folded twice like a letter. Traycard / Inlay Card – This is the paper part that is embedded in the back of the case under the disc that is not removable. It usually has the barcode and track listing on it, and also has the side spine text (artist name) that you see when cases are stacked. It is perforated left and right. If it is printed only on one side, the plastic tray is usually black or white. If the traycard is printed on the inside, the plastic tray would be clear to be able to see the printing through it, including the left edge when the case is closed. Also called an Inlay card. Select the files you wish to include. 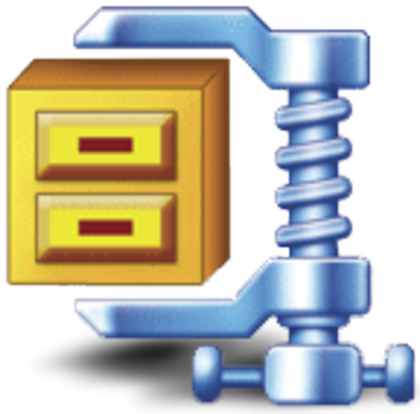 A compressed or zipped folder with the same name as your new folder will appear in your folder. You have an opportunity to name it anything you want. It should have .zip as its extension. 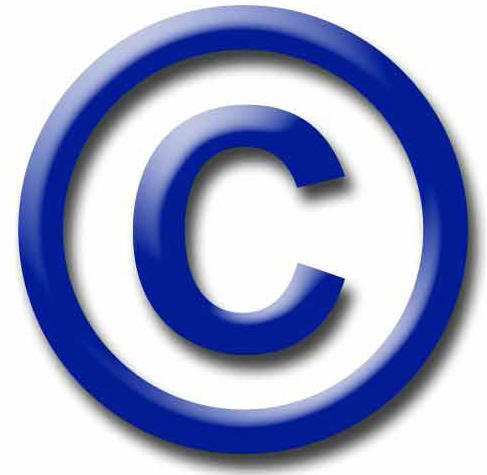 It is ILLEGAL to use the logo unless you are a member of the Motion Picture Association of America (MPAA), the Recording Industry Association of America (RIAA), the Software & Information Industry Association (SIIA), the Business Software Alliance (BSA) and the Entertainment Software Association (ESA), subject to each member entering into a formal Uniform Authorization Agreement. Association members should contact the MPAA, RIAA, SIIA, BSA, or ESA for more information. 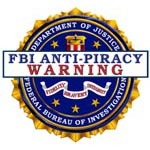 Unauthorized use of the FBI seal, name, and initials are subject to prosecution under Federal Criminal law, including Sections 701, 709, and 712 of Title 18 of the United States Code. And, do you really think a logo will keep people from pirating it? My personal opinion is that the more your music is out there, pirated or not, the more exposure you get. 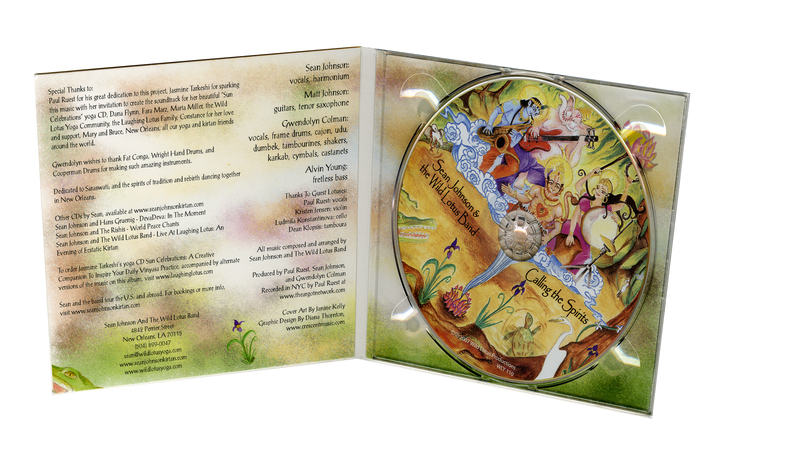 I think a personal plea from the artist (such as: Instead of copying this CD for a friend, please order one.) works better than an official logo that looks like it came from Big Brother. Unauthorized Copying Is Punishable Under Federal Law. Stock photo sites are especially good for finding backgrounds and enhancements to complement your own photos for your CD/DVD insert. Here are some sites you can search to see if anything jumps out at you. BE SURE TO CHECK IF THEY ARE TRULY COPYRIGHT/ROYALTY FREE and always check how the credit (if any) should read. What’s the Difference Between Free and Royalty-Free Images? “Royalty-Free” may not mean FREE. It usually means that when you PURCHASE the right to use an image, you can use it as many times as you like without any additional payments. A royalty payment is a payment that must be made each time an item is used or sold. So royalty-free images for sale, means you pay a one-time fee for the use of the graphic. http://www.sxc.hu/index.phtml (free) – Photos only – some require permission. http://cgtextures.com/ FREE. Be sure to download the Largest size. Limits you to 15 MB downloads per day unless you pay for a membership. http://www.freedigitalphotos.net/ royalty free photos and illustrations. Every image is free, with an option to buy high resolution versions for use in print or graphic design. http://www.pdclipart.org/ Clipart, public domain. Free. Most are very small though and probably unusable for print. http://publicdomainpictures.net/ Many free. Some $1.50 each. http://graphicriver.net/category/all Be sure to check resolution and format. http://www.imageafter.com Photos. Free. You’ll need to download and email to me – they don’t seem to have numbers. http://www.mediabakery.com. Medium resolution should be fine for a cd cover. Those run $5-$40. Try using couponcode BAKER25 for 25% off. www.lcweb2.loc.gov/detroit/dethome.html – US Libray of Congress – Old/Historic Photos – most copyright free, but must credit. Check collection copyright restrictions first. If you download a photo, get the wording of how they want it credited (in your liner notes). “Our Earth as Art” Satellite images – public domain – just include credit. 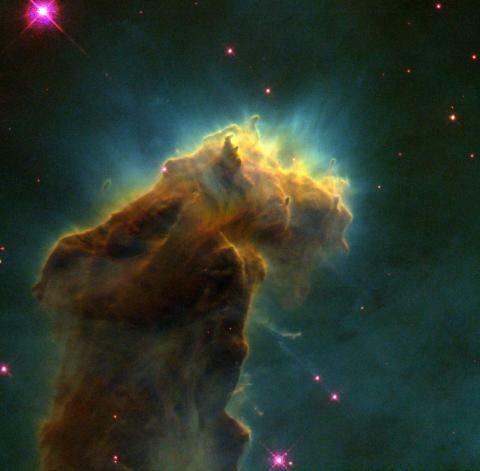 http://earthasart.gsfc.nasa.gov. Be sure to download the hires version. Great for backgrounds. http://www.clipart.com I do not have a subscription to this, but it’s not too expensive if there’s something you really like. Illustrations, photos, fonts. http://www.bigfoto.com Free. bigfoto.com must be credited with the image. May not be high enough resolution, but I can probably use. http://www.123rf.com – $50 for use on resale items. $3-4 for items not for sale (personal use). http://us.fotolia.com/ $4-5 each for personal use, $10 for resale. http://www.microstockphoto.com $2 each. EITHER DOWNLOAD THE HIGH RES IMAGE or give me the image number and I’ll pull down the high res version to use. If you have me download, I will pass on any costs associated with obtaining the image(s) you want. The most common and most frustrating problems I see with CD projects are typographic errors and omissions by the artist. Please use this proofing checklist to try to avoid as many errors as possible, ideally before even submitting your text to the designer. Some of these things may seem obvious, but when you get to the design stage and you’re tired from long hours in the studio, or late for an appointment, it’s easy to miss things. Print out a copy – don’t proof only from the computer screen. Proof from both – you’ll see things on the screen that you won’t notice on paper and vise versa. Get someone else not directly involved in your project to proofread. Many errors are missed because you already know what it’s supposed to say and you actually read missing words and typos correctly. There is a rule of thumb in the business – don’t proofread your own work. Have several people proof. Ideally, only a single printout should be marked so that all changes are made on the same proof and all your proofers can see what the other proofers have caught. Find somewhere quiet where you won’t be distracted. Mark corrections with a red pen. Scan for specific problems, such as mixing up the spelling of there, their and they’re. Read through in different page/section orders – start from the back, for example, or read from the bottom up. Use a closed pen to point to each word as you read it. Cover all of the paper except the sentence you are proofreading, and read one sentence at a time. Don’t rely on your spell checker. Do not expect your designer to be your editor. You are ultimately responsible for making sure everything is right. Pay extra attention to special symbols. Song titles correctly spelled, punctuated and capitalized. Song order and times are correct for master supplied. Song order for lyric section matches song order for master and traycard. Spine info is correct and the same as on disc and cover. Barcode number is correct (if applicable). Look for extra spaces and double punctuation in text. The mock up is correct regarding folds and panel placement. Last minute changes were made correctly. PROOF: A general term something used to see what your file will look like when printed. There are many different types of proofs. 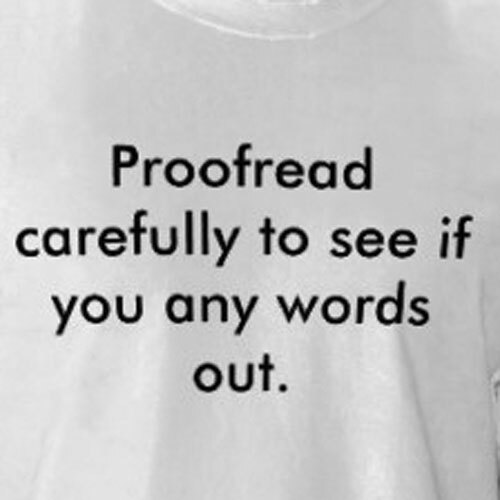 The most common proofing method these days is a Soft Proof. This is usually a PDF sent via email or downloaded. It is the most economical and expedient, but it does have limitations that you need to be aware of. Important: Final output can vary DRAMATICALLY from what you see on your monitor. Because your files are printed in CMYK, not RGB, which is what the monitor displays and your ink jet printer normally prints, you cannot rely on your screen or printer to proof colors. They’ll be CLOSE. In addition, each monitor is calibrated differently and therefore the same PDF will look different on yours and the person sitting next to you. Even the angle at which you view your monitor and the lighting in the room can effect how colors look on screen. Printing it on your home printer is helpful and should always be done, but also problematic. Every printer is calibrated differently, and will produce different results. Even how much ink you have left or what grade paper you print it on can affect certain colors. So, if color reproduction accuracy is super important, be sure to mention this to your designer – you may need to request a HARD PROOF from a calibrated proofing printer. Note: PDF proofs are also usually low resolution to keep files small enough to email, so the images may appear a little blurry. You should always look at a high resolution file for at least your final proof. This will be a larger file, but more accurate. Check that all requested changes were made. Keep a copy of changes so you can refer to it against the proof. Do not send replacement files for text already placed and formatted by your designer – you will incur extra charges to re-place/re-format. Only individual changes and additions that refer to these proofs should be sent (unless you need drastic changes). Send all changes together in one email once everyone involved has reviewed the proofs. Do not allow more than one person to send changes to your designer. When you get subsequent proofs, besides checking that all requested changes were made, check to be sure that nothing else was altered. Sometimes text shifts when words are added or deleted, so check to make sure copy hasn’t rewrapped or dropped off or accidentally changed when other things are changed or added. Look one more time for spelling. Look at EVERY proof as if IT IS your first proof. Once you are satisfied with your final proof, you will be asked to approve it in writing. Usually you can just reply “Approved” on the email that had the PDF proof. If you are approving a hard proof, you will be asked to sign and return it. Remember, when you approve your final proof, you indicate that everything on the proof is correct. If a problem is discovered later, you will definitely incur additional costs to fix it and may even entail scrapping a print run. It is worth the investment – a pro will make you look like a pro. Try radically different concepts – including something that does not show your face on the cover. Get crazy with your poses. Let your personality come out. Have fun. Have some funny phrases handy to use just before you take the photo for a natural smile. Pay attention to what you’re WEARING. Avoid tiny prints. Check with each other so you don’t clash. Do you blend into the background? Use makeup! Airbrushing is expensive. Double chin? Turn your head to the left or right about 30 degrees. Take many many many pictures, back to back. Like at a football game. Click click click. This is particularly helpful with group shots to get the best look on everyone’s faces and everyone’s eyes open. Don’t rely on reviewing your pics on a tiny LCD screen. Unless your album is a concert recording, avoid live concert pics, especially for the cover. Avoid banners, placards, and other promotional items. Look around for things to eliminate or tidy up in your scene. Pick up stray papers, arrange curtains, dust the piano, pick up your underwear. Outside, watch for trash and other things in your scene that you might not notice until you’re looking at proofs. Try different angles off frontal – some slightly off, some drastically off. LIGHTING: Avoid using flash – natural lighting is better, even if it is an extra light brought into the room. Pay attention to time of day and angle of sun. How does it interact with objects in the scene, the background or reflections on people’s glasses, car windows, mirrors. To produce a dramatic effect, light from the side. Try bouncing your flash or a light off a ceiling or wall. Using something white (poster board, for example) will reflect light onto the darkened side of the face. Overcast days can complement skin tones and help keep eyes wide open. Need a basic background? Stretch an ironed sheet and illuminate with a cheap shop light. Shine the light from the front for bright crisp feel. From the back for a dramatic glow. Angle your instruments slightly away from the camera to avoid reflections. Avoid posing people within 5 feet of a wall because of the shadows that will result (unless you want those shadows for effect). Try angling about 5-10 degrees off perpendicular instead of straight on the wall. Be aware of your background. Avoid mirrors. If you cannot avoid reflective objects in the frame, position yourself with at least a 30 degree angle to avoid the reflection. Avoid alcohol or tobacco in your photos. Some newspapers and magazines may not print them. Without getting into technical photo stuff like f-stops, if you have an SLR, try different aperture settings for different depth of fields, which will bring your background in or out of focus for a different feel. Stock photos: If you need an image you simply can’t create you can check online stock photo sites. Click here for some of my favorite stock photo sites…. Those annoying sticky strips on the top edge of some cases. You have probably struggled removing them. They’re hard to remove for a reason – they’re a combination of an anti-theft device and an identification label for CDs stocked in a bin. It displays the artist, album title, release number and barcode number. 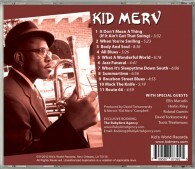 Not required, but it does give a “big label” feel to your product and it can help your CD stand out in a retail bin. Use stickers for awards, quotes, or description. Usually placed on the outside of the shrinkwrap and discarded. Useful for last minute additional emphasis. There are actually two types of outerwrap, but they both tend to be called “shrinkwrap” – “shrink”wrap is the softer, shrinkable plastic, and Cello wrap (also called polywrap or cigarette wrap) is the more crisp plastic. 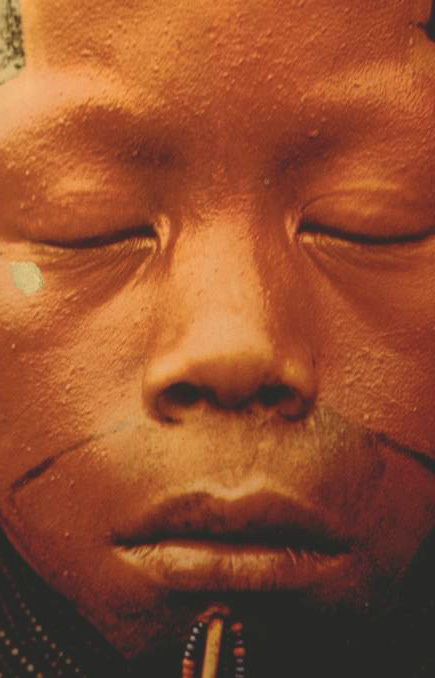 Shrinkwrap is used on sleeves and digipaks. Cello wrap is used on DVDs and Jewelcases and has folded sealed edges instead of the fused seam. Used mainly for retail product – it ensures the customer is getting an untampered with product, and also protects the case during shipment. DO NOT WRAP PROMOS. 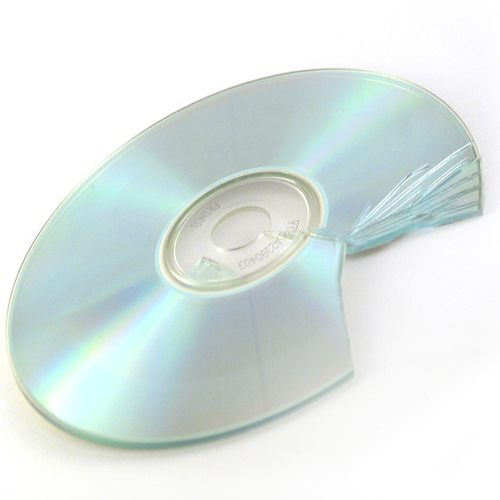 Even if you receive all your CDs with outer wrap, remove it before sending to reviewers and DJs. Since it costs almost the same amount of money to design and press a CD with 4 songs as it does one with 12 songs, I recommend using your full album as a promo. 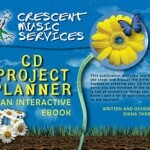 You can request some of your CDs be marked for promotion only. This usually entails having the barcode punched or marked out and PROMOTIONAL USE ONLY stamped on the CD face in white over your artwork. You will also want to request no shrinkwrap and top spine labels on these units. 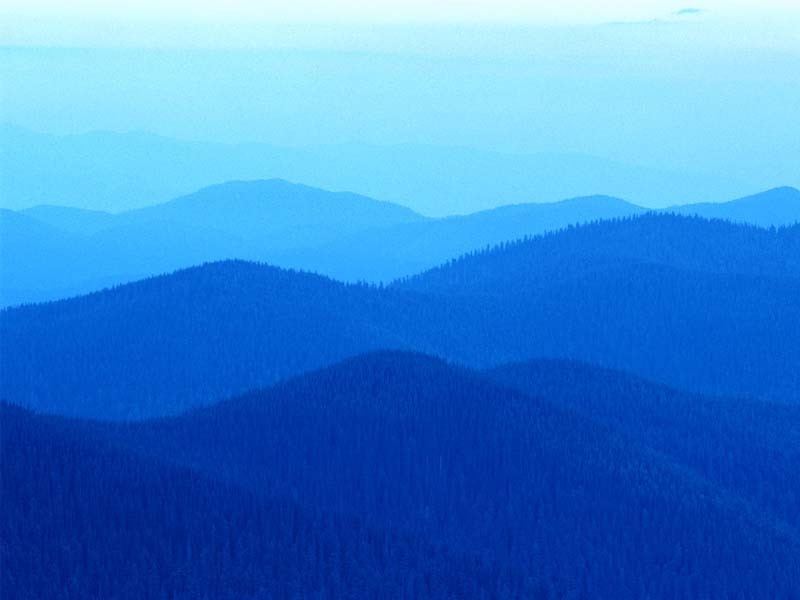 Color is a lot like music – waves of energy that effect our emotions. Track titles, written by. Include track numbers here also (not just the traycard). Always include contact info. A website is a must, a phone number and email are optional because they often change. Photo / Art credits – Don’t forget to identify people in the photos. You might need to get permission to use a professional photograph (get a signed release). Method Two: Combined at end of liner notes (takes less room). Introduction: The hymns on this CD are mostly, though not all, ones I listened to growing up as a missionary kid in Mexico. 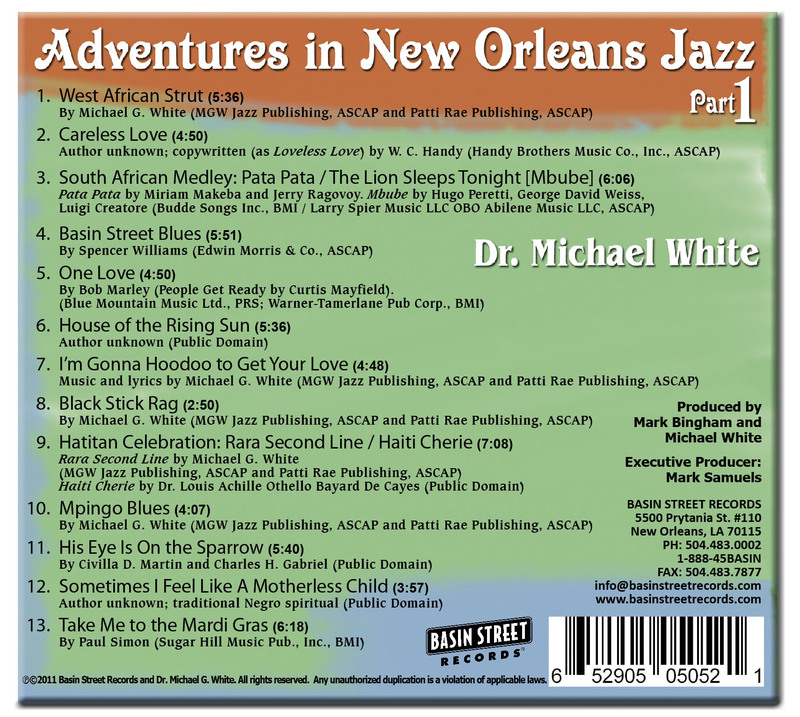 In that foreign land, my brother Michael managed to amass an impressive array of gospel music…. TIP: Don’t try to squeeze too many liner notes so they are so small that no one can read them. Don’t waste your money printing a package no one can read without a magnifying glass because you tried to save money. TIP: DON’T USE ALL CAPITAL LETTERS. USE ALL CAPS ONLY TO EMPHASIZE IMPORTANT WORDS. ENTIRE SENTENCES OR PARAGRAPHS IN ALL CAPS ARE TOO HARD TO READ. SEE WHAT I MEAN? Clean your scanner glass and photograph with a soft cloth before placing each item. Do not scan at a lower resolution and then enlarge it later! This actually lowers the resolution and can turn it into garbage. For example, a 2.5″ x 2.5″ image scanned at 300 PPI that is later doubled 5″ x 5″ becomes 150 PPI. Photoshop cannot invent pixels that were never present in the image to begin with. So you need to scan something that will be used at twice the size of the original picture at twice the resolution (600 PPI at 100%). I’d rather you scan too high. Black & white and grayscale are NOT the same type of file! A 1-bit black & white scan contains only black or white pixels; there are no shades of gray at all. The bigger and cleaner the original artwork (such as a logo), the better it will scan. Convert your color scans to CMYK color mode to get a sense of how they will look when printed – some colors, such as blues, greens and oranges, can change dramatically. Grayscale images should be saved in grayscale (8-bit) mode. Avoid RGB or CMYK – it tends to add a magenta tinge to them. Save your scans as TIF. If you use EPS files, save the image with an 8-bit TIF preview. Do not open and resave a JPG mutliple times – every time you do, it degrades the image. If you plan to tweak the image and resave, save as a TIF first and use that file to edit. MOIRE Crisscross patterns or checkerboarding in a scanned image. This occurs when an image was previously printed using the offset process (i.e. a picture from a book or magazine or newspaper) which converts the image into little dots. This may not show up on inkjet or even laser printouts at home. 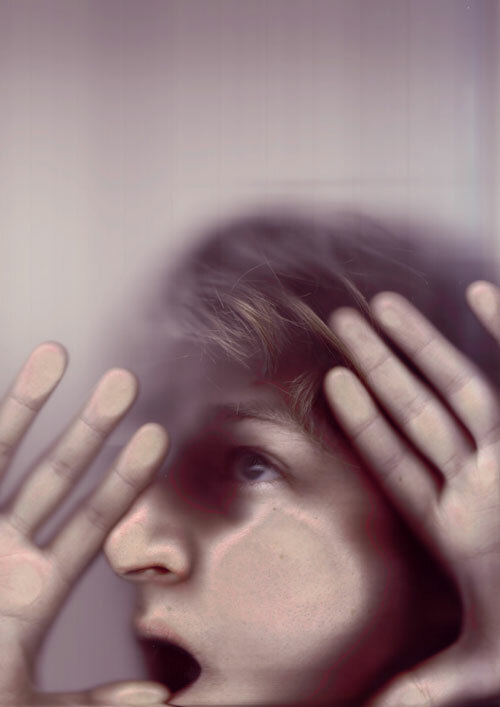 Moire problems do not occur with scans of actual photographs. One common occurrence is scanning an old CD insert you want to reprint. I do have a fix for this, but be aware that the fix includes slight blurring, so you should always scan from real photographs if possible. This PDF will take you through the steps and discuss the different aspects of creating your CD from the point you finish in the studio. It is full of answers to things you need to know – and a lot of questions you need to ask yourself. A barcode, or UPC code, is essential if you’re planning to sell your CDs in stores or online. Each product has a unique 12-digit number encoded in the bars, which are scanned upon purchase to track inventory and sales. As a special service I can provide you with a UPC barcode number free of charge when I do your design. This UPC will be unique to your project, but will not be registered to you. This is quite adequate and appropriate if you are just releasing a few records. However, if you are trying to run a real record label, and intend on releasing many records over time, then you will need to invest in your own barcode. To get your own barcode, you must join the Uniform Code Council: www.uc-council.org. The current price is about $750 I think. Special software is needed to generate the barcode. I can do that for you if you need it. Nielsen SoundScan collects weekly sales data from 14,000+ retail outlets in the U.S. and Canada, which are published on their site and in the Billboard charts. If you receive a barcode from Crescent Music Services or other manufacturer and you want your release tracked by SoundScan, you will need to change the barcode registration to you, the recording artist, as a sub-label. To do this, download the Title Addition Sheet from www.soundscan.com. The Title Addition Sheet must be submitted to SoundScan’s Database Department by email at dbase@soundscan.com or faxed to (914) 684-5606. You can also subscribe to SoundScan’s reporting service for a fee. CDs sold at gigs or from small stores do not normally get tracked by Soundscan unless you are a paid member, SoundScan does allow artists that tour to report these tour sales to Soundscan as venue sales.The actual reporting process is very easy, once you are set up: calculate the venue sales, get the venue to sign off on the sales, and then fax the info to SoundScan.It’s part of the reason that Prince’s idea to give away his Musicology CD a few years back was such a great idea.The price of the CD was included in the price of the ticket, and all sales counted towards SoundScan – which cumulated in great Billboard visibility, which gave him more press, which drew more people to his show and made more people buy the CD etc. In case you’re interested in joining, the last I learned about the fees and procedures sounded unteneble for most indies: 1. On letterhead of the label, please state that you are a label interested in taking part in the Venue Sales Program. Also state how long you have been in business. NOTE: YOU MUST BE IN BUSINESS FOR AT LEAST TWO YEARS. 2. List the artists you wish to report sales for. NOTE: IT MUST BE MORE THAN ONE ARTIST UNDER THE LABEL THAT YOU WILL BE REPORTING SALES FOR. 3. Fax the above information or email. 4. There will be a $500.00 annual fee to report venue sales. Acceptable methods of payment are: Company Check & Credit Card. *Please include in the letter that you fully understand that you will be charged this annual fee and your method of payment. * 5. Please provide name, billing address, phone number, fax number and email to receive proper mailing and billing instructions. 6. You will then be contacted to set up an account to report and transmit sales along with proper documentation to verify all sales. Digits 1-6: your company ID number assigned by the UCC. Digits 7-10: release number, assigned by you. Digit 11: configuration digit (2 = CD, 4 = cassette, 1 = vinyl LP, etc.). Digit 12: check digit, formulated by the computer when the barcode is generated. This is used by the scanner to confirm that it read the barcode correctly. Tip: If you are pressed for time, start your graphics before you finish in the studio. You provide: Liner notes, photos or other images, a rough layout. Troubleshooting: review all proofs very carefully. You provide: The master and PQ code sheet (your mastering engineeer provides this). 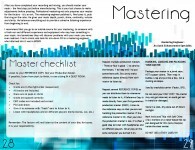 Be sure to ask your mastering engineer to include the TEXT ENCODING and ISRC coding on the master. IPR form is also required for all new manufacturing orders. Troubleshooting: Do not give me your only copy. Label your master inside the clear ring. Don’t write on the face of the disc. 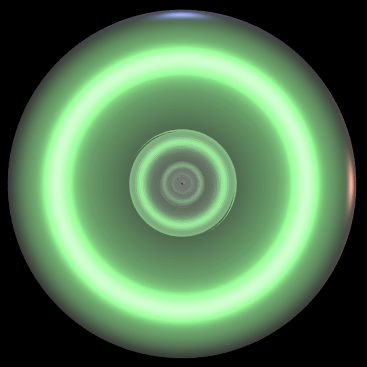 Listen/View to your “reference copy” (a copy made directly from the master by the engineer). Do not open your production master. If there is no problems with the reference copy then the you know the productio master is OK. If there is a problem with the reference copy, check the master at that spot to see if it is due to an issue during copying, or a problem with the master. Make a new reference copy if it’s not a problem with the master. TURN TIMES: Day 0 = Once your artwork and master are finalized, approved and submitted. Production takes about 8 workdays. Digis and jackets take 13-17 workdays. Reorders will ship in 7 workdays. Bulk discs ship in 6 working days (rush turns for extra charge are available, with turns as fast as 1 day). Quicker turns may be possible at no additional charge. Or you may want to consider having us do some shortruns to tide you over. Call to discuss your schedule and we’ll tell you how we can accommodate you. TO MAINTAIN SCHEDULE: Graphic files must be finalized and approved or submitted by client by 10 a.m. at least 8 workdays before shipment. Master and IPR form must be received by factory at least 7 workdays before shipment. All manufacturing instructions, deposits, and ship-to addresses must be received at least 5 workdays before shipment. Printed materials be in factory at least 2 workdays before shipment. Troubleshooting: changes after this point will be very costly and will definitely delay things. Typical order of 1000 CDs comes in boxes of 120 each with four 30-unit boxes inside each weighing about 26 pounds, with the total order weighing 247 pounds. Time Saver: Request overnight shipping (for extra charge) of smaller quantities to tide you over, with the remainder shipped ground to save you money. Can also request direct shipping to your distributor or tour gig (up to 3 addresses with no extra charge). Troubleshooting: When you receive your discs, please check them over carefully. Make sure all the features you ordered are present. Play the disc. Spot check discs from different boxes. Pros: As a designer, I love to design digipaks. Many people love how they look and feel. They are perceived as being more “eco-friendly” (which isn’t exactly true, however). They automatically include full color inside because the printing is all on one side and folded over. Cons: As a consumer I don’t like them. They take up more room in my CD collection (I MP3 all my CDs, take the inserts out of the jewelcase and file them in a vinyl sleeve). They get dinged easier and can’t be repaired. If the plastic hub breaks there is no way to replace it (jewelcases are interchangeable). Yes, jewelcases do crack, but you can replace every part of them by cannibalizing another case. Jewelcases are more water resistant. You can set one on a wet table and it will still protect the insert. Try doing that with a digipak. You can even set a cold sweating drink on a jewelcase with no damage. If the CD comes off the hub, the disc can slide out and become damaged easily. The jewelcase snaps shut, so even if the disc pops off the hub, it isn’t going anywhere. You get less and pay more: They have less room for information. A 4-panel insert in a jewelcase has 3 full panels for information, plus the cover and traycard. A 4-panel digi only has 1. You’d have to do a 6-panel digi to have more panels for text, and that would cost about twice as much as the jewelcase with a 4-panel insert.